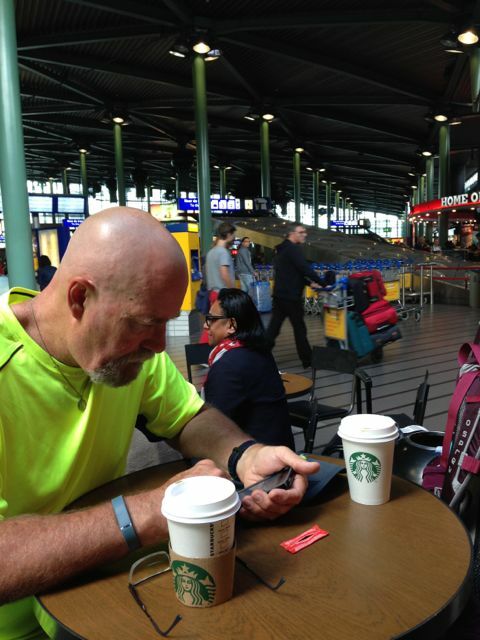 We arrived at Schiphol Airport, Amsterdam, only to discover our credit card was not a pin and chip card – they wouldn’t accept it – so no train tickets for us!!! Fortified with a Starbucks Americano, Michael immediately went to work trying to remedy the problem. ‘Capital One’ is a great credit card for travel but it didn’t always work in Holland – we wanted it for the trains. 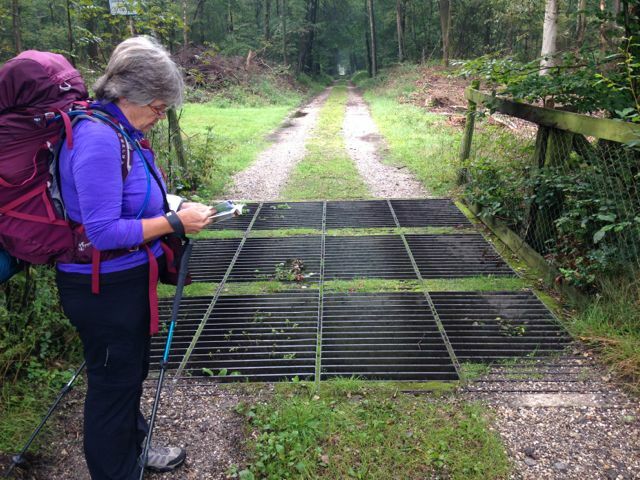 Our latest adventure began when Hilde, my friend and aunt in Holland, suggested we hike the Marskramerpad, a historical trail crossing E-W through the middle of Holland, from the German border, to the North Sea and right through Deventer, the town where she lives. Plans were made and the trip was on! 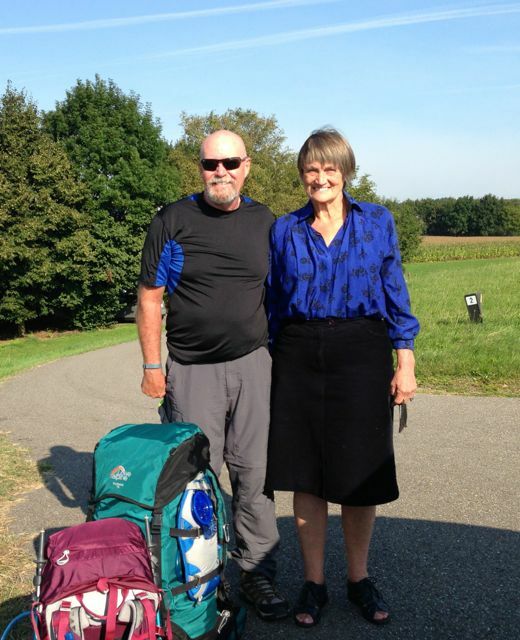 Hilde met us at the train, brought us to her home, and wined & dined us in style. She made the best Moussaka I have ever tasted! 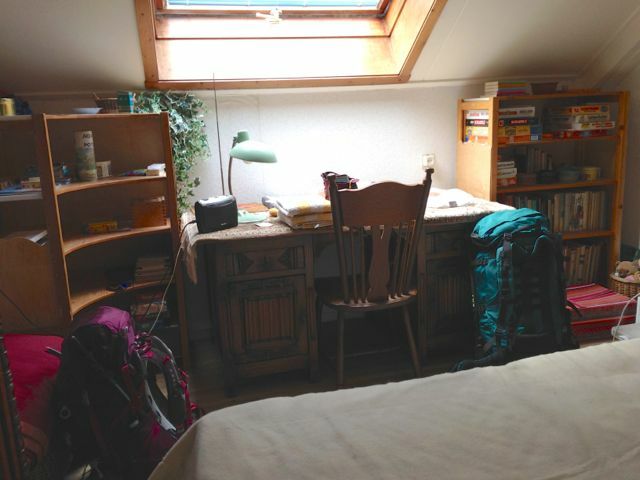 We slept that first night in her bedroom loft, a charming little nest and the perfect antidote to jet-lag! Hilde made it so comfortable for us at her house and had so many tempting suggestions as to alternative activities that we almost didn’t go on our hike. The weather forecast was a bit dismal and we WERE jet-lagged, after all. But, a mixture of curiosity, stubbornness, and the determination to see if this was really something we would like to do long-term (as in the Compostella) gave us the needed push and off we set, into the wilds of Holland. 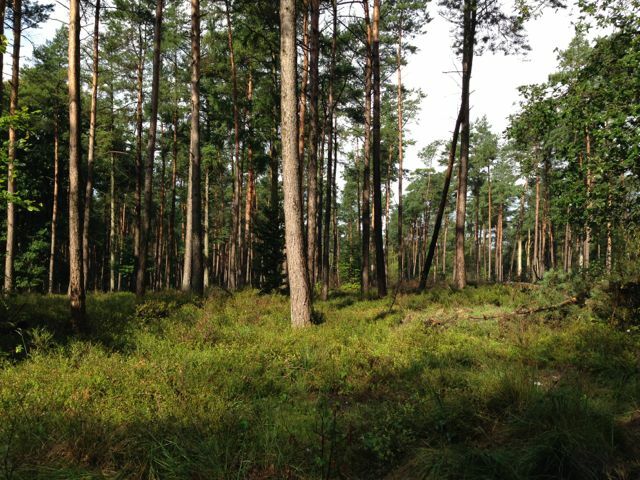 Yes, there are wilds in Holland, believe it or not, and we got to see them!! 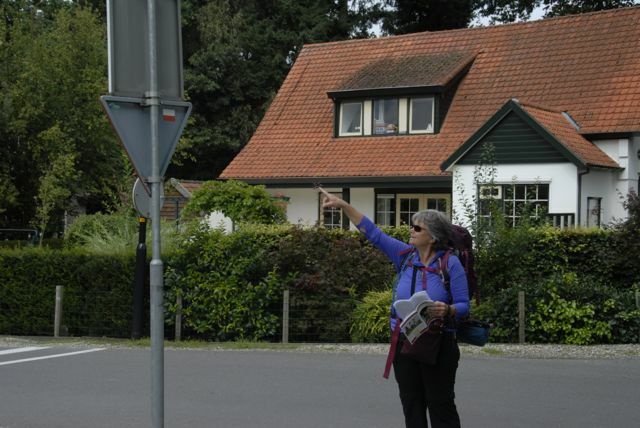 Not only did Hilde pick us up at the train, she also purchased and translated the route directions for us from Dutch to English and brought us by car to what we thought was the starting point of the hike. Consulting our directions, maps, and the locals, we eventually found our way to the actual “path”. The first day turned out to be a beautiful sunny day. 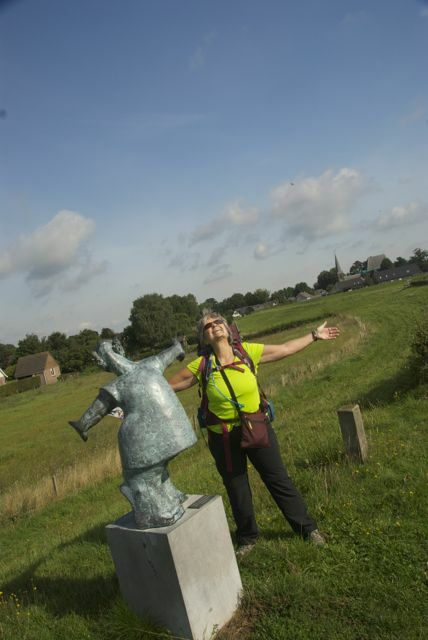 We found that our path took us along the top of a dike, past lush, GREEN fields, church steeples, and farms with horses, cows, and the fattest potbelly pigs I’ve ever seen! On the dike was a statue of ‘A Girl in the Wind’. As we were admiring her, an old, typically dutch farmer carrying his grand-daughter on his shoulders stopped to say hello and chat. When he discovered our intended hiking route, he showed us on our map where to find the ‘best bakery’ in the region and insisted that we MUST go there. At that point in time, we weren’t hungry and we were just starting out but by the time we came across the bakery, we were ecstatic. We were dying for a coffee, hungry and, this being our first full day of walking, we found ourselves quite tired and needing a rest. 22 km later with sore feet and a big thirst, proud of our first day’s achievement, we arrived at ‘The Pijnapel Restaurant’ (pronounced pineapple – by the way, that’s the owner’s name … Mr. Pineapple!) where we hoped to stop for the day. It was still warm enough to sit outside and enjoy a beverage and a snack. The owner of the restaurant was delightful. Upon calling the local B&B to book us a room and finding it fully booked, he drove us to ‘The Loenermark Hotel’ in the next village, where we spent our first night. We couldn’t believe our good fortune!! I was still sleeping and wanting to sleep some more at 7 am when Mike woke me up with zippers zipping and clunks and thumps as he got his pack organized. No more sleep for me! I got up, showered and dressed and we went down for breakfast. It was a typical continental breakfast, spectacular, as only Holland can do. The waitress delivered it right to our table. We sat and enjoyed, then consulted our directions, trying to get ourselves oriented on the map and trying to figure out how to get back onto the Marzkramerpad. All of that delayed us so we didn’t get underway until 10 ish. 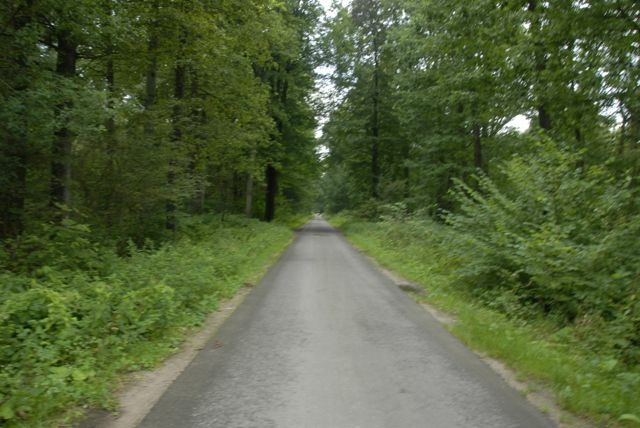 We decided to make our way back to ‘the path’ by going to a town called ‘Beekbergen’. It was here that we spotted the first of these deer. 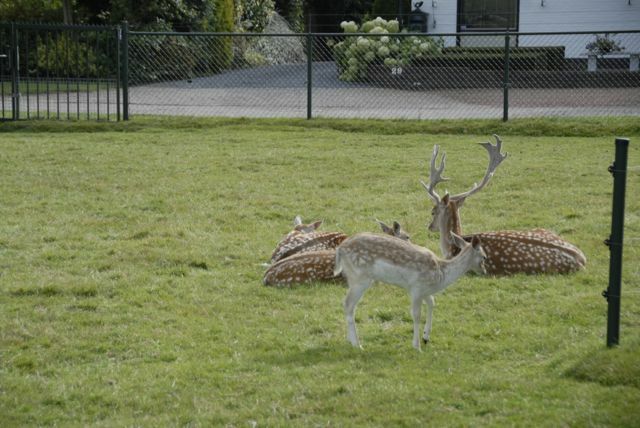 What kind of deer are these? We never did find out the answer to this question but we saw these deer EVERYWHERE for the rest of the trip! We set a much faster pace than the day before and held the pace longer. Over hill and dale we went, stopping to rest occasionally and to eat the rest of our food from the day before. Finally got to a town called ‘Hoenderloo’ just as it started to rain. 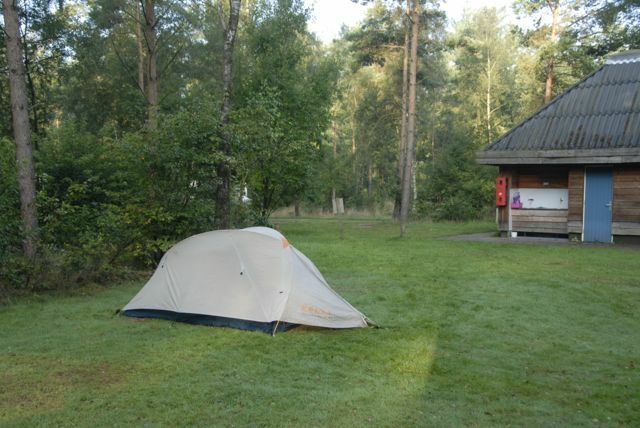 There were campsites around but the hotel was closer and we were tired, having done 19 km. 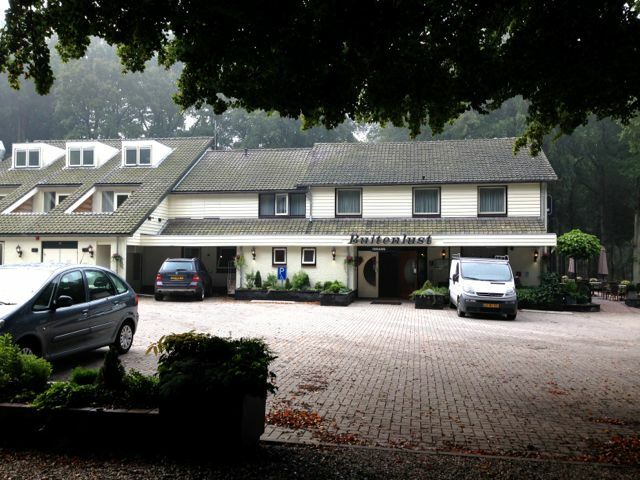 We called to reserve a room at the hotel, the ‘Buitenlust’, and there was a room for 65 euros including breakfast so we headed there, in the rain. When we got to the hotel, we found a really lovely spot. Immediately we hopped into the 2 man tub and washed ourselves and our clothes. There was a heated towel rack which dried our clothes more quickly. Then we headed down for dinner. Expensive but oh so good. Back in our room by 7. We again couldn’t keep our eyes open. Laid down to read and before long, were asleep. It was a noisy hotel so neither of us slept very well. Mike was up earlier than me again! 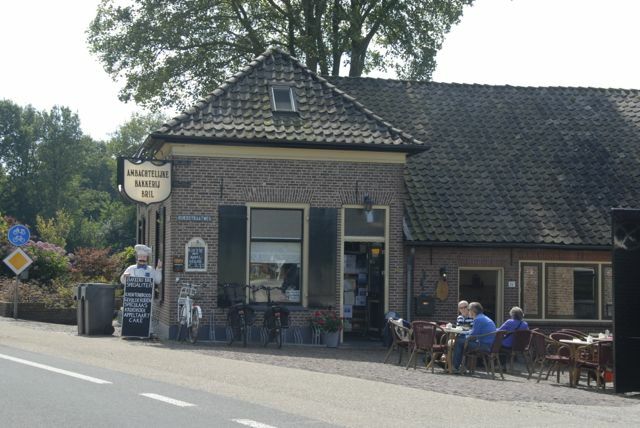 Went down for breakfast – there was a delightful buffet – everything was fresh from the bread and pastries to the dutch ham, several choices of cheese, eggs, yogurt, fruit and juices. We made some sandwiches for ourselves from the breakfast buffet to eat later and were on our way by 930! It took us a while to find our way but eventually we got on track again. Early on our walk this day, the weather kept us guessing. Most of the time it was perfect … a combination of clouds, sun, & cool temperatures … just the way we like it. But on this particular day, we got it all …. 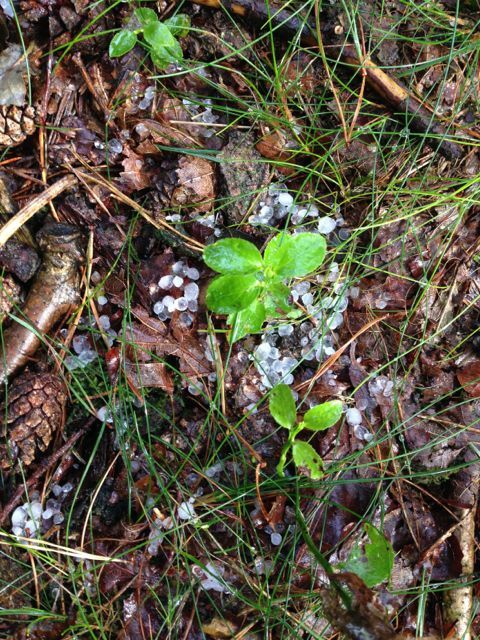 rain … thunder … lightning … and hail. 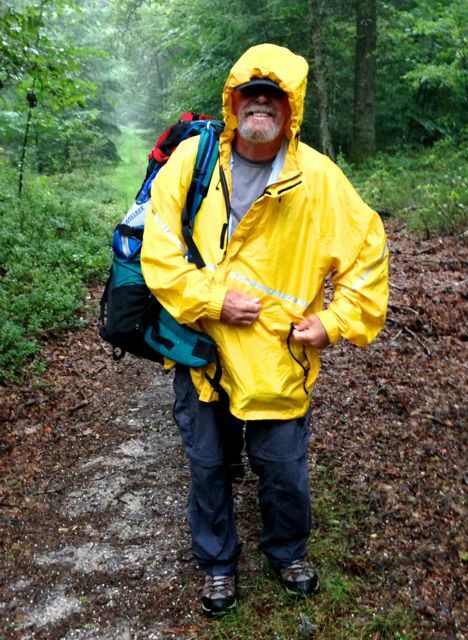 Thank heavens for Mike’s insistence on bringing rain gear. Here is what we looked like …. 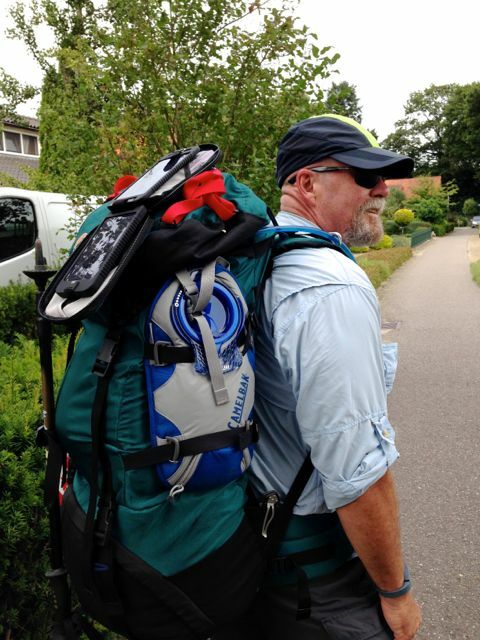 “the hunchback’ some other travelers named me …. 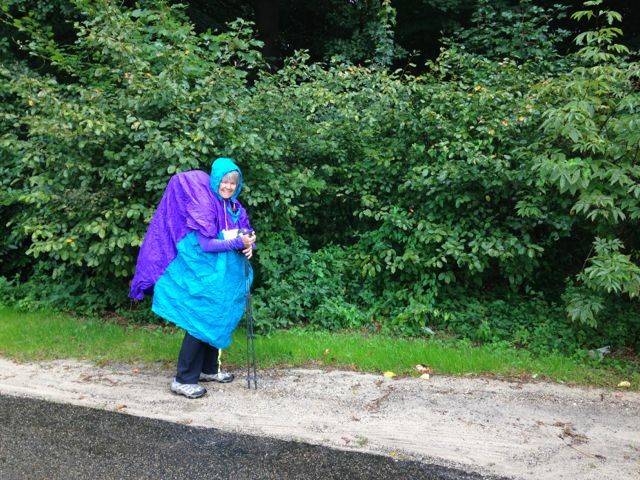 but … I was dry and so was my pack! We did receive many gifts from Mother Nature though. 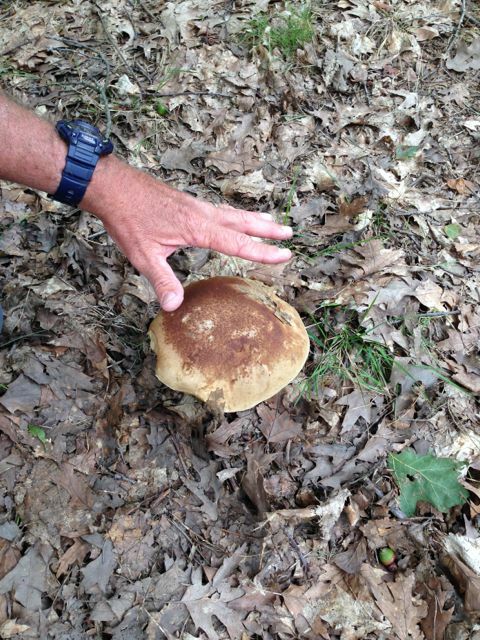 First, a giant mushroom as broad across as Mike’s hand! 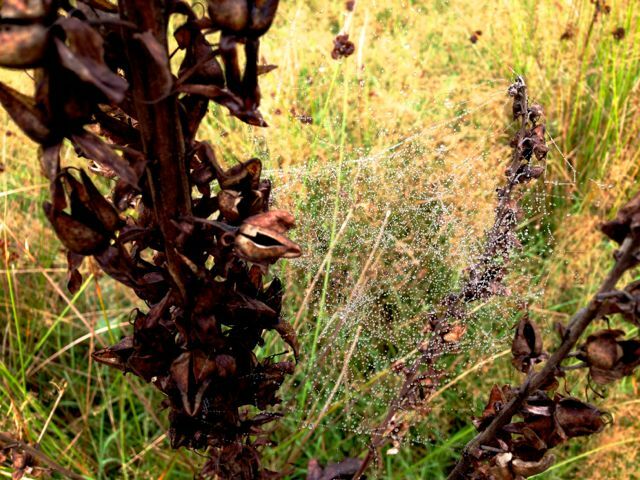 As we tramped through a meadow just after the rain, we came upon these massive spider webs that had been transformed into ‘Christmas-Tree-like’ sparkling creations – nature’s best. When the sun came out again, the sunlight on the wet woods was spectacular! Steam rising from everything, including us – and did the sun ever feel good! 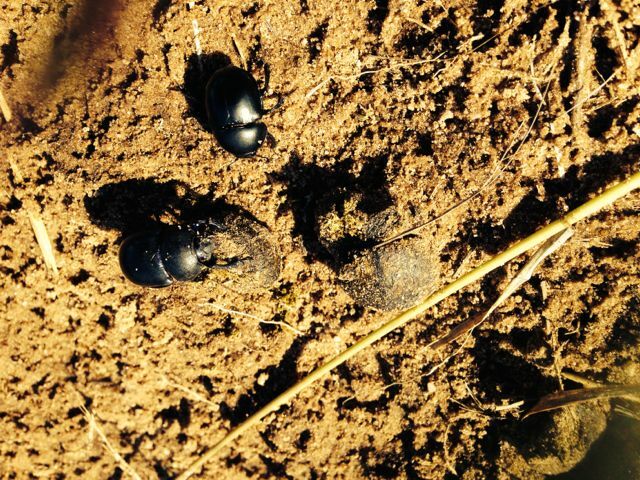 Even the dung beetles came out to roll their ….. ! Later in the day, we lost the trail again! Route – finding was the most difficult aspect of the trip. 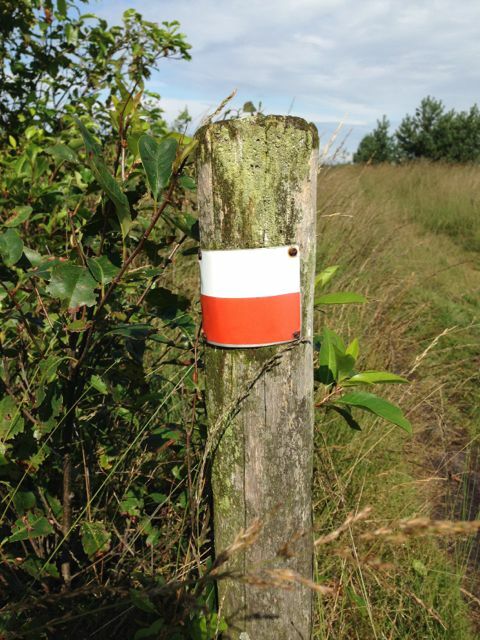 Not the distance, not the weather, not the lack of accommodation – merely finding your way from one marker to the other. Even though the way was relatively well-marked, staying on top of it was a challenge. But, we signed up for adventure and that’s what we got. 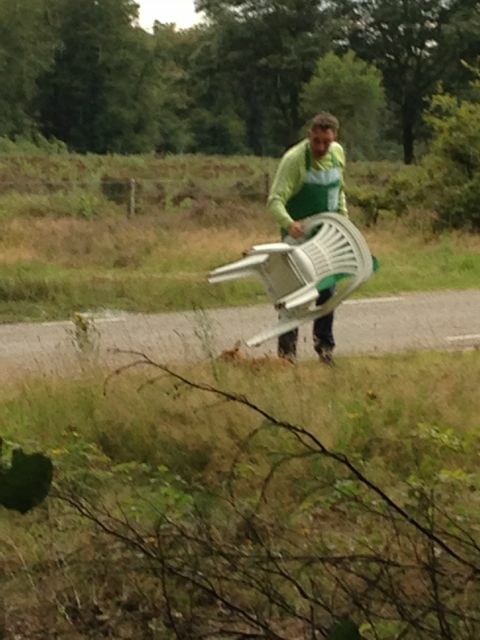 We were aiming for a town called Kootwijk. We did okay following the trail until we got to an open meadow where we missed a turn and ended up doing a much longer distance. Picture a bloodhound – casting about for scent – that was us casting about for clues as to which way to go! At one point, I lost the charge on my phone and we think it’s then that we missed a signpost because we were so busy getting my phone charging on the solar monkey charger. We walked and walked and walked without seeing any signs until we finally met a man doing some work on the path. He told us where we were and that’s how we discovered we’d gone way too far in one direction. The whole time we were walking though, we’d heard a loud-speaker with a booming voice but couldn’t decipher any words. 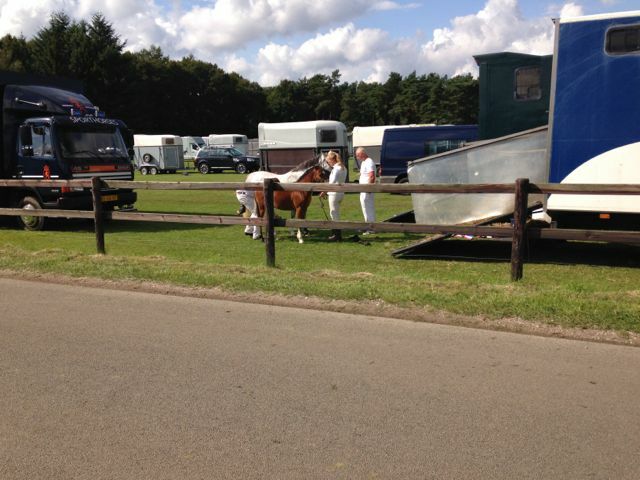 As it turned out, it was a horse show and we stumbled right into the middle of it. Lo and behold, we were suddenly in horse country with magnificent horse farms, paddocks, barns. 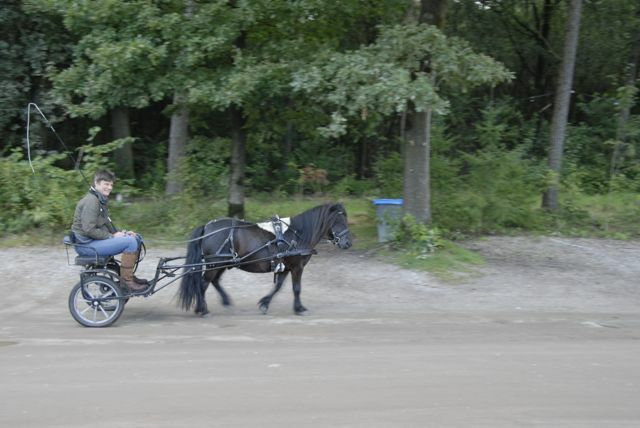 horse trailers …. Finally, we arrived in Kootwijk, exhausted after 20 km or thereabouts of walking, to find that the hotel we had planned to stay at had shut down (no wonder they didn’t answer the phone when we tried to call and make reservations). However, there was a splendid pub/restaurant right beside it that was open so in we went for beer, wine, meatballs and fries. Our waitress was nothing but helpful. 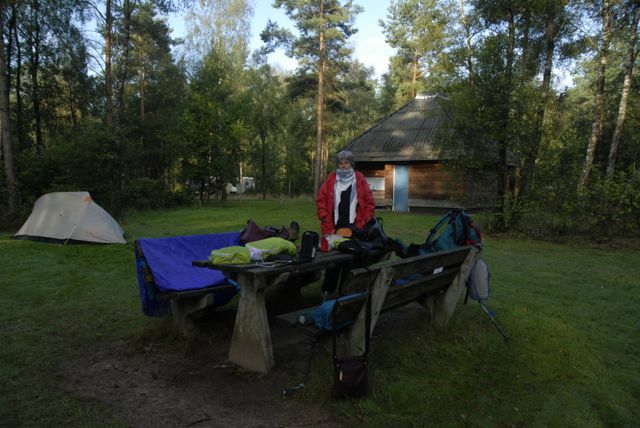 She called around and found us a “natural” campsite a kilometer away. She gave us the directions and off we went once more. Michael innocently asked, “Aren’t you happy that I brought the tent?”. So now, we can truly say that we experienced every eventuality and every type of weather too. We finished our dinner and headed off to find our campsite. No problem and best of all, free to us trekkers because our lovely American credit card (chipless & pinless) was not accepted and it was the only way to pay. We set up our tent in record time and, with nothing else to do and feeling energetic still, we set off to find the Marzkramerpad start for the next day. Really … a wild rooster crossing. That took all of five minutes. 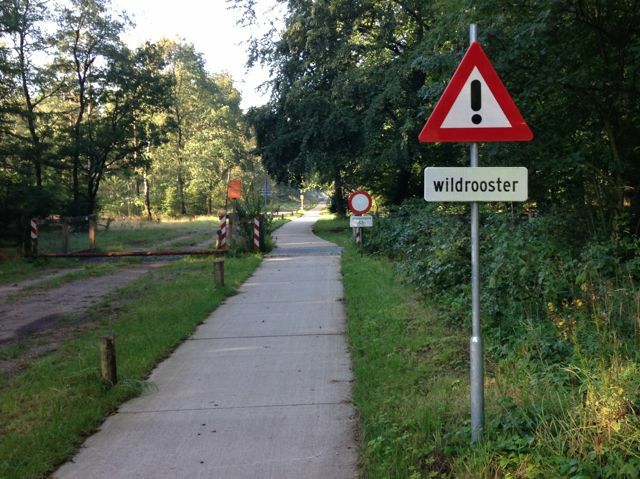 Not only did we find our starting point, we also encountered what we call a ‘cattle-guard’ , called a ‘wild rooster’ by the dutch. By then it was about 8pm and we settled in for the night. It was the night we agreed on a divorce. Not between each other but between us and tenting. Our sleeping bags weren’t warm enough … thank god for the space blanket! Not only that but I think we were directly under the flight path of Schiphol airport so if it wasn’t trains zooming by, it was airplanes droning. I slept very little. It was truly an excruciating night. Sore hips, cold, noise, Mike contentedly snoring …. we were also close to the bathrooms with doors slamming &…. well, you get the picture. It rained on and off all night. Finally, I was comfortable and warm but it was time to get up – the story of my life! We packed and were on the way by 830 but we had no food, no coffee, so back we tracked to the restaurant of the previous day. They were closed – no food for us. 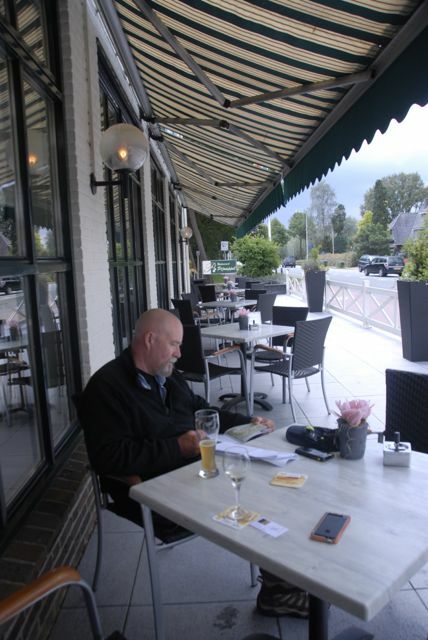 We had no choice but to continue on to the next town, Stroe. Once again, we got hopelessly lost. Once again, the locals saved our skins. Once again, they pointed out the route we needed to follow. 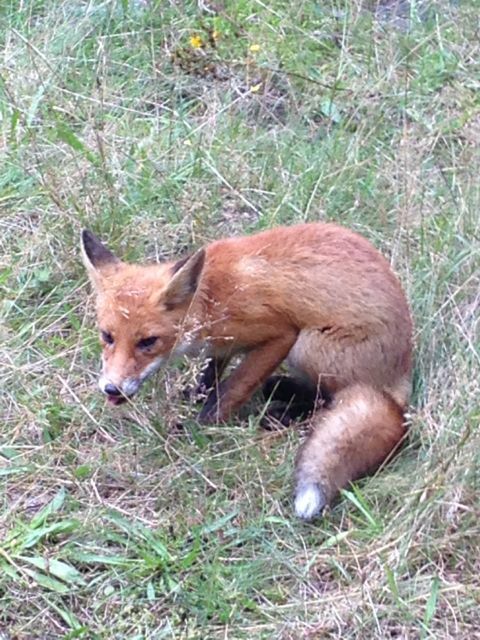 On this part of the trip, we had an encounter with a very sly little fox. A roadside vendor had been selling ice cream but the rain forced him to close up. As he was putting things away, we spied this fox dashing back and forth between the vendor’s wares and a small bush where he would madly dig a hole, drop in his stolen treasure, and return for more. We were quite entertained but not so the vendor. He went chasing after it with his plastic chair. It ended up drawing quite a crowd. The poor guy should have set up his stand again – he had a captive audience! Along the way we met some other people who told us that that since Stroe is in Holland’s ‘Bible Belt’, nothing would be open, it being a Sunday. By then it was noon and we had walked for miles with nothing to eat – our spirits fell. Then it started to pour rain and waiting under an overpass, we met some cyclists who told us that the restaurant was nearby, that it would open at noon, and that it was called ‘the Rotterdammer’. When the rain let up a little, we left the relative dryness of our overpass to find it and find it we did. There we had breakfast, FINALLY. Mike had Uitsmijters and I had an omelette and we each had 2 coffees. 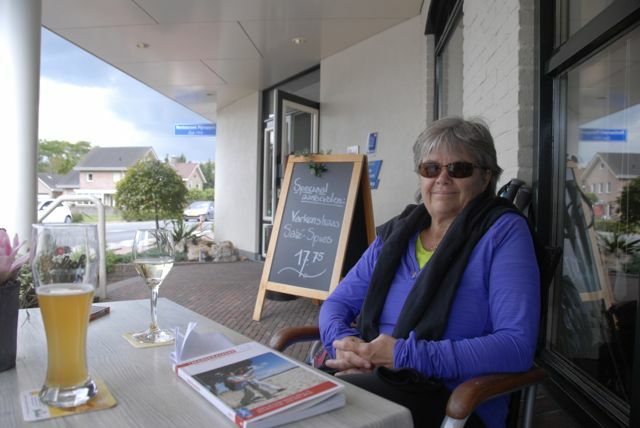 We met another couple and from all of the information they gave us, we decided it was the perfect place to end our walking adventure and hop on a bus to a small town called Garderer and a hotel called Overbosch. We found it no problem and by 3 we had showered and snoozed and were off to investigate the neighborhood. First though, I had to doctor the only injury of the trip … the small toe on the left – it had a blister right at the end of it. I used the technique learned from a fellow walker whom we met on the mud bay walk in White Rock, BC. I sterilized a needle, put a thread through and punctured the blister with it and left the thread hanging out. Worked perfectly and no longer hurt. 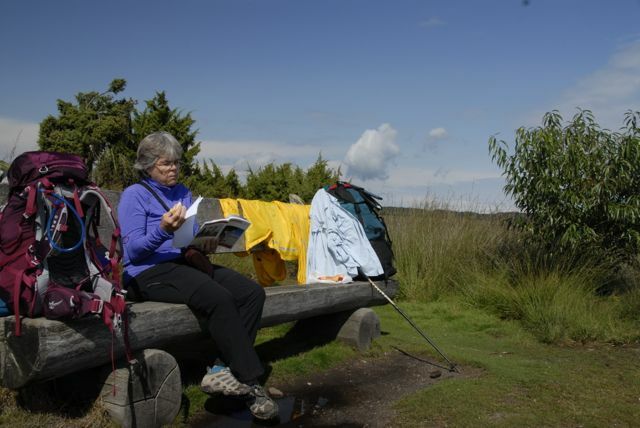 This day, the last day of our walk, was a really difficult day with nothing to eat and no coffee until after 12 noon but with our batteries charged both physically and electronically, we were once again in heaven with a great dinner …. pork satay shared …. a bottle of wine and a cheese plate for desert, pictures downloaded and plans for sharing our adventure. Next adventure? Off to Amsterdam and the Mercure Hotel and Mike’s 60th birthday!! !